By Allan Fox: Moments after Gervonta ‘Tank’ Davis (21-0, 20 KOs) blew out the hapless replacement opponent Hugo Ruiz (39-5, 33 KOs) by a first round knockout last Saturday night, Davis’ promoter Floyd Mayweather Jr. revealed that his young 24-year-old star will next be facing Japanese kickboxer Tenshin Nasukawa in April in an exhibition match in Japan. This is the same 20-year-old Nasukawa that Mayweather recently effortlessly knocked out in the first round two months ago on December 31 in a 3 round exhibition match at the Saitama Super Arena in Japan. Mayweather was said to have made $9 million for the short fight. It appears now that Mayweather is going to look to get Davis a similar payday, if possible, against the inexperienced Nasukawa, who doesn’t have a background in boxing. It’s unclear how much money Gervonta can make fighting Nasukawa in what would be a circus level fight. Mayweather is a popular, so it’s not surprising that he got a nice payday against Nasukawa. But Davis isn’t at that level. “We got an exhibition match against a guy Tenshin in April for Tank,” Mayweather revealed last Saturday night following Gervonta ‘Tank’ Davis’ 1st round blowout victory over 32-year-old Hugo Ruiz. “Yes, he’s fighting Tenshin in an exhibition bout in Japan. Yes [it’s going to be a boxing match], an exhibition in April against Tenshin. In May, it’s the real fight. We don’t know. When I get back, I’ll talk to my staff, my team, Leonard [Ellerbe],” Mayweather said. Mayweather’s revelation that he’s going to match Davis against Tenshin hasn’t gone over too well with the boxing public. They think Mayweather is ruining Gervonta’s career with his poor match-making, and they see him as a promoter who has no clue what he’s doing. Mayweather is hustling fights for Gervonta, but he’s not matching him against the guys that the fans want to see him against like Vasyl Lomachenko, Tevin Farmer, Mikey Garcia, Oscar Valdez, Gary Russell Jr., Ryan Garcia and Miguel Berchelt. If Davis isn’t going to get the huge money that Mayweather got fighting Nasukawa, it would be better to steer clear of this move in order to preserve his reputation as a serious fighter. It’s one thing for Mayweather to be fighting kickboxers and MMA guy, but then to drag Gervonta into it, it’s an off-putting move. Mayweather should do his thing with the exhibitions, and let Gervonta be a serious boxer. Davis isn’t old and over-the-hill like Mayweather, and he wants to fight the best. In terms of boxing news, Gervonta, 24, defeated Ruiz by a 1st round knockout last Saturday night on SHOWTIME at the Dignity Health Sports Park, Carson, California. Davis chased the bigger Ruiz around the ring before trapping him against the ropes late in the first round, and then knocking him out after catching him with several hard shots to the head. Ruiz went down, and got up. The referee Jack Reiss stopped the fight with one second left in the round. The fight was stopped at 2:59 of round one. It would have been interesting if Reiss had let the fight continue like he did with the Deontay Wilder vs. Tyson Fury fight in the 12th round after the British fighter was seemingly knocked out cold. Reiss gave a count, which looked very strange to some boxing fans given how hurt Fury was. If Reiss had allowed Ruiz to continue fighting in a similar way, Davis would likely dropped him with the first punch he landed after the action resumed. “People try and criticize Tank for fighting these guys. Criticize me,” Mayweather said. “He just fought a former world champion. He’s [Gervonta Davis] a 2-time world champion, and he hasn’t even had 22 fights. There’s no rush,” Mayweather said. It wouldn’t be a good idea for SHOWTIME to televise Tank Davis’ exhibition match against Tenshin in the U.S. If the idea is to try and turn Davis into a star, having his exhibtiion fight against Tenshin shown in American would be a disastrous move. 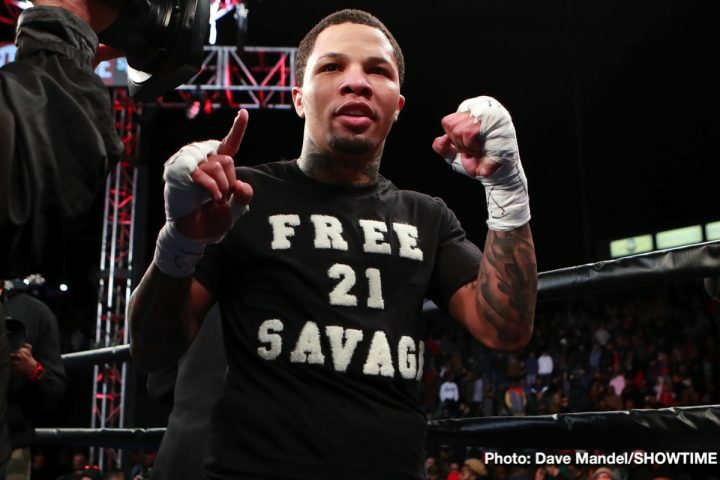 U.S boxing fans don’t want to see mismatches between a little 20-year-old fighter with no experience, aside from his recent first round knockout loss to Mayweather, facing a true professional world champion in Gervonta Davis. Mayweather scraping together fights against the MMA guys is clearly his thing, but he’s going to make a mockery of Gervonta’s career is he starts him along the same path. How much longer before Mayweather does that with his other fighters signed to his Mayweather Promotions. It seems like a big joke, as it doesn’t provide real entertainment for the boxing masses. When fans know that these are non-competitive fights, why would they want to watch them? Mayweather looked horrible in his last fight against Tenshin, and yet he was still able to knock him out in the 1st round after dropping him three times. Mayweather looked out of shape, and slow, very slow. His hand speed is gone at 42. It didn’t matter. Tenshin was too small and inexperienced in boxing to compete against the old Mayweather. The fans are already criticizing Mayweather for the mismatches that he’s putting Davis in with. The fans didn’t like how a replacement opponent for Abner Mares, who was pooled from the featherweight division to face Davis, was a guy that was also picked put from the 126 lb division in Ruiz. The fans want to see Davis fight talented super featherweights, not older fighters on the downside of their careers picked out from the featherweight division.